PhotoFile # 5 - Havana! This magazine describes a People to People culture tour to Havana, Cuba by a group of American photographers. 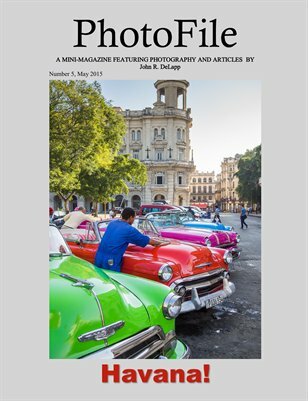 Included are 62 photographs and written descriptions of the travel and experiences during a week-long stay in Havana. This tour focused on photographing ordinary people and life on the streets of Havana. The tour was lead by renowned photojournalist, Peter Turnley, who has coordinated many previous tours to Havana. 36 pages. PhotoFile: PhotoFile # 5 - Havana!